A good friend of ours with A-Fib recently had a crippling ischemic stroke, even though her INR on Coumadin was 2.5, right in the middle of the desired range. Her left side is paralyzed. It’s heartbreaking to eat dinner with her and watch food dribble from the side of her mouth. She’s getting good care and physical therapy, but she will probably never recover fully. 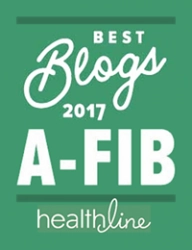 A recent retrospective study of more than 930,000 stroke patients found that 20% of acute ischemic stroke patients had A-Fib in 2014, up from 16% in 2003. 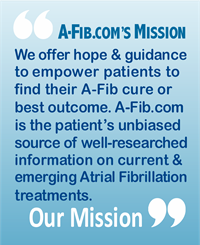 And despite recent improvements in stroke treatment outcomes (and stroke prevention), the negative effect of A-Fib was pretty much the same over the 12-year period of the study. 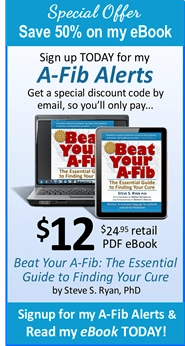 Nearly 10% of A-Fib stroke patients died (“mortality”), compared to about 6% for patients without A-Fib. …the prevalence of A-Fib among patients admitted with acute ischemic stroke is rising, especially among white and elderly patients. The authors found that A-Fib patients were more likely to receive thrombolytic therapy. 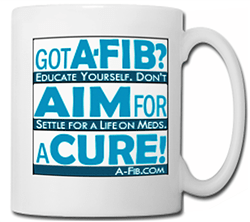 But even so, they showed worse outcomes, with 9.9% dying versus 6.1% of the non-A-Fib patients. And the A-Fib group had a higher rate of acute kidney injury, bleeding, infectious complications, and severe disability. They had longer hospital stays, higher costs of care, and more non-home discharges. This study didn’t investigate hemorrhagic stroke which is more likely to happen with increased age. 99% of people over age 65 have microbleeds in the brain. Taking anticoagulants to decrease the risk of an ischemic stroke can turn these microbleeds into full hemorrhagic strokes. Older A-Fib patients are between a rock and a hard place. See Anticoagulants Risky over Age 65. 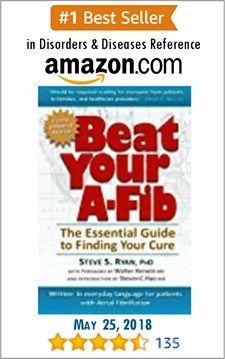 Living with A-Fib, especially as you get older, is often a death sentence. Don’t settle for a life on meds. 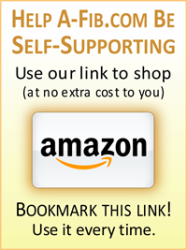 Seek your cure! Alkhouli M, et al “Burden of atrial fibrillation associated ischemic stroke in the United States” JACC Clin Electrophys 2018; DOI: 10.1016/j.jacep.2018.02.021. New Report: Is Your Stroke A-Fib-Related or Something Else?